Price: £5.75 (incl VAT) Sorry, this product is no longer available. Jungle Formula Natural Roll-On 50ml is a natural roll-on insect repellent made using 40% lemon eucalyptus oil that offers up to 8 hours of protection against midges, mosquitoes and biting insects. Up to 8 hours protection. Does not contain DEET or IR3535. For use in countries with no known risk of malaria or other insect transmitted diseases. 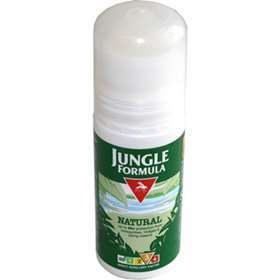 Jungle Formula Natural Roll-On is a natural insect repellent that can be used by children from 3 years old. Apply Jungle Formula Natural Roll-On carefully to all exposed clean and dry skin except for eyes and lips. For external use only. Harmful if swallowed. Keep out of reach of children. Avoid contact with eyes, lips and damaged skin. Eucalyptus Citriodora Oil, Alcohol Denat, Aqua, Natural Plant Extracts, Hydroxypropylcellulose, Aminomethyl Propanol, PEG-14 Dimethicone. Product code: JUN120R Price: £5.75 (incl VAT) Sorry, this product is no longer available.